How much stash do you have? Now be honest! Do you make careful considered yarn purchases with a project in mind, or or you more of a stroke, feel, need, must buy and then I'll think of something to make at a later date type person? I fall into the latter category I'm afraid! Actually no....strike that!!! I love yarn! The feel, the colour (oh how I LOVE colour, the smell....I love it all. And I always accumulate yarn with all good intentions of whipping up something gorgeous and meanwhile the stash pile grows and grows. Unfortunately I can't crochet as fast as I can think up new things to make! 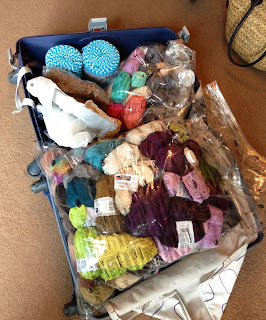 Obviously, I returned from Holland with a little new yarn ;-) Hmmmm...... well it was a LOT of new yarn. More than ever! I had prepared though...and took with me two of those vacumn bag things. Two large bags. Very large!!! No problem I thought. This time the yarn will fit in the case easily. Of course it did! After much huffing and puffing, repacking, jiggling of stuff in the case and then jumping on the case. It did in fact fit in......JUST!!! Put it this way...if I had been stopped at customs there is no way I would have been able to repack the case. And opening said case may have maimed unsuspecting customs officers! Wanna see how much fitted in the case? Those vacumn bags are worth their weight in gold! I came home with.... the yarn for the new blanket that I started while I was there, a sport weight cotton for another blanket, some extra yarn for a blanket already in progress (I ran out of the green! ), the yarn we dyed, some zphagetti yarn to make a rug (more of that disaster in another post! ), some Icelandic lace and medium weight yarn to try and some Drops Delight to make their Romantic blanket. Phew....so just a little yarn! I made myself the promise that no more yarn would be either bought or accumulated by other means until I had at least finished 2 more projects. I'm running out of places to hide store my yarn mountain!